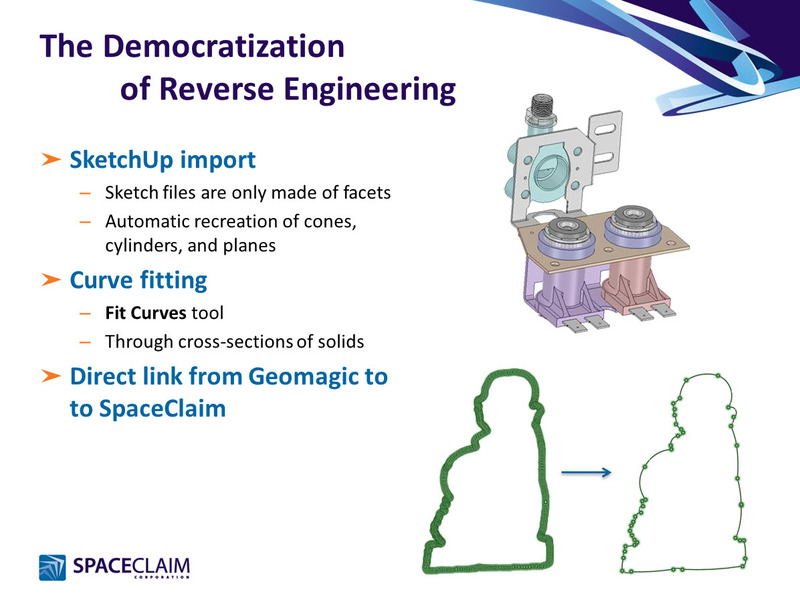 A week ago Blake Courter, co-founder of SpaceClaim, gave me a briefing on SpaceClaim 2012 which will be announced later today. I’ll get to the new features in minute. But first I would like to recite some of the chest beating that Blake did during the web meeting. Here is a pretty bold slide from Blake’s presentation. For a CAD system that is trying to find its place in the market interoperability is not just a feature to make a noise about. 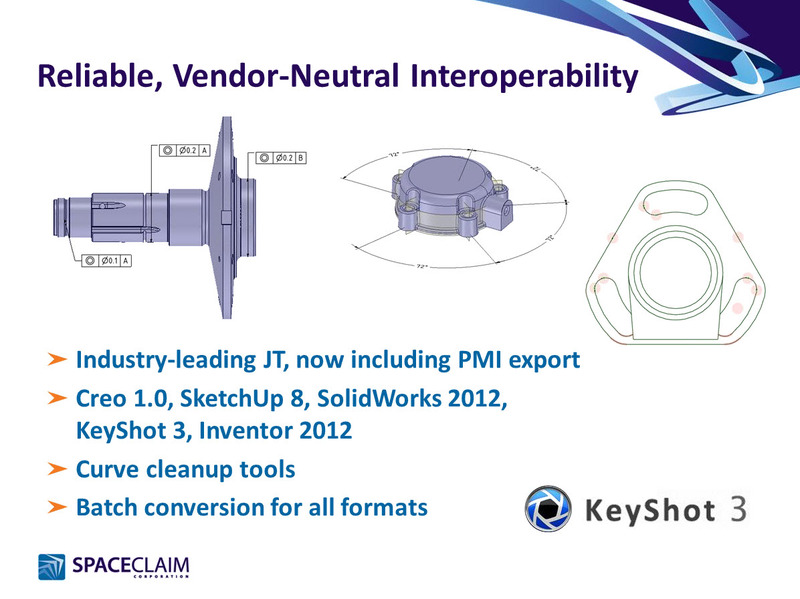 SpaceClaim understands that interoperability is key for it to gain market share. 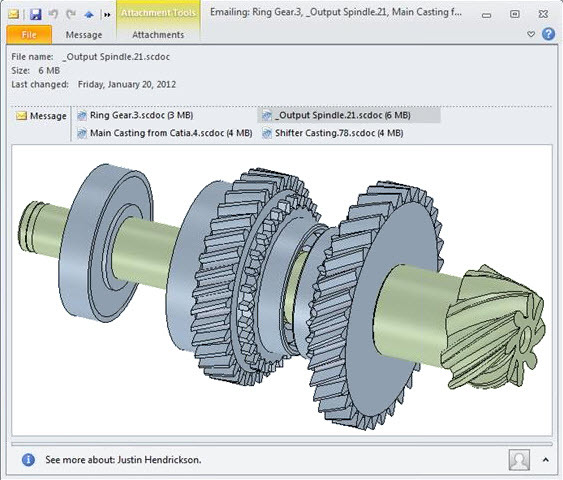 SpaceClaim 2012 comes with translators for Creo 1.0, SolidWorks 2012, Inventor 2012 and even SketchUp 8. 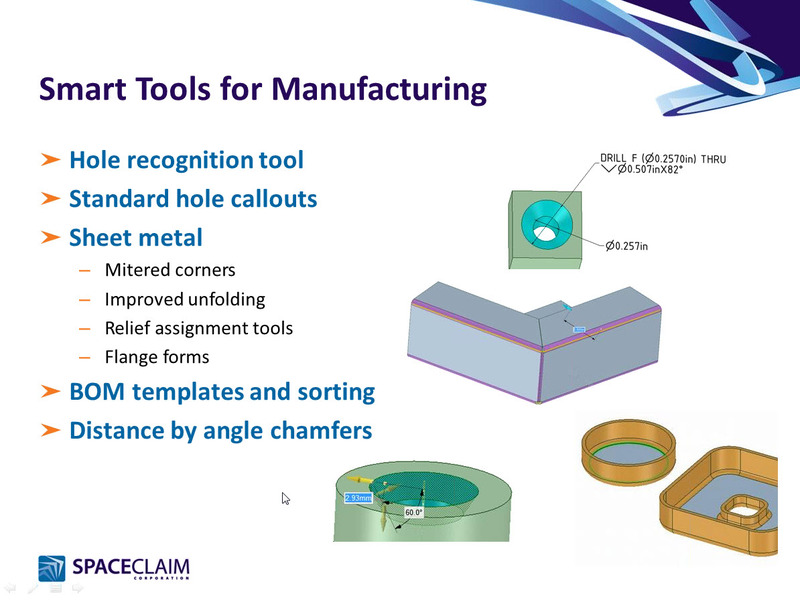 SpaceClaim 2012 also comes with some handy tools for Manufacturing, such as a hole recognition tool that figures out holes from cylindrical faces and chamfers, fillets, etc. 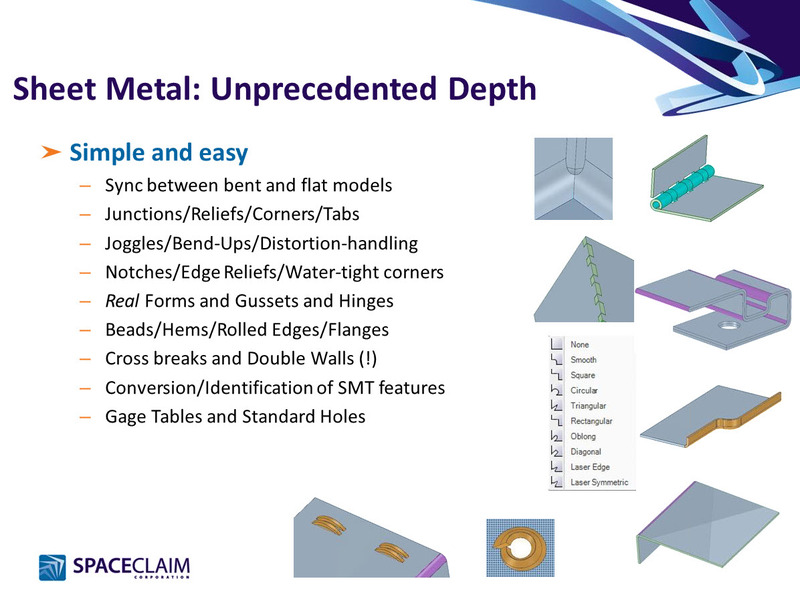 Blake tells me that SpaceClaim’s partnership with TRUMPF is paying off well. Apparently TRUMPF is making them do all kinds of things to sheet metal. Blake also tells me that their partnership with Geomagic is in its initial stages and looks promising. We can expect to see improvements in reverse engineering in upcoming releases. The SketchUp 8 importer I mentioned earlier is interesting because in SpaceClaim 2012 you can import SketchUp models (which are basically a bunch of meshes) and the software can figure out holes, cones, planes, etc. Apparently this does not use Geomagic technology. SpaceClaim wrote this on their own. SpaceClaim had a free viewer. They have now taken it a step head by making it a Windows shell extension. 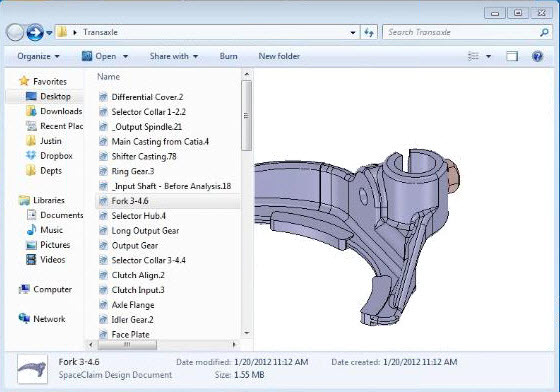 Which means that you will now be able to view SpaceClaim models in programs like Windows Explorer and Outlook. I find a bulk of SpaceClaim’s marketing to be about telling people what they are doing is wrong as can be seen from this snippet of Blake concluding slide. I find that approach quite interesting. I asked Blake what he thought of people who feel that Direct Modeling is a feature and not a product. 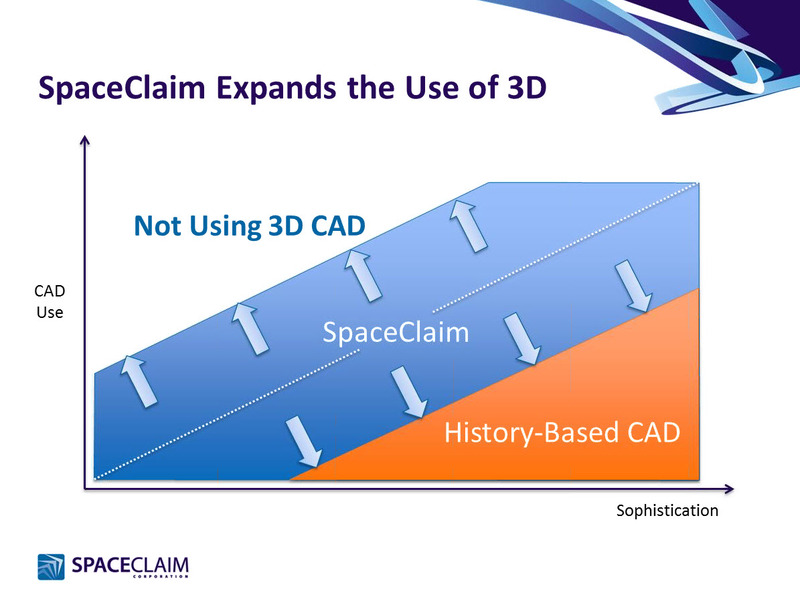 He replied that while other CAD vendors were trying to make Direct Modeling out to be a feature, SpaceClaim is one company that is focused 100% on Direct Modeling and that’s why they are so good at it.